As mail servers get more advanced ways to detecting spam, spammers are getting more advanced ways to get through. 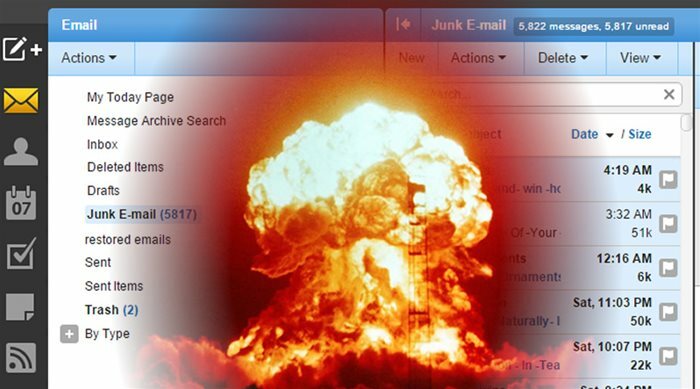 I finally broke down and decided that enough was enough, and implimented my own nuclear option to fighting spam. Thus far its been extremely effective. This is not something most mail servers support, so if you want to do this, you will need to be prepared to write your own code. Gmail and Yahoo are not the most friendly to Email Marketers. But there are a few tricks you can use to help get your messages into the Inboxes. The key is to remember it is about user privacy. Recently I had to whitelist the IP blocks from iContact to ensure their newsletters would get through to my clients. I had to directly contact iContact to get their IP Blocks, of which they gladly gave me. I rarely see spam coming off their servers so I felt it was safe to whitelist them on my mail server. After building a CRM system for a company, we noticed that some of our marketing emails were hitting the Gmail's Spam folder. A little Trial and Error revealed some interesting facts about how Google's Spam Filter works. If you run a mail server, and do any kind of bulk emails, you need to sign up with the feedback loops to ensure you keep your mail list clean, and your IP reputation in good standing. I have put together a complete list of all known feedback loops. I also include some background information on FBLs and return path who manages most of them. Yahoo runs one of the strictest Anti Spam setups of all the Free mail Servers. If you send any kind of bulk emails then you likely haven't had much success getting into the inbox of yahoo. Your Emails are either bounced with a deferred message like this Reason: Remote host said: 421 4.7.0 TS01 Messages from 69.80.230.7 temporarily deferred due to user complaints - 4.16.55.1. or they end up in the spam folder. After switching IPs of my mail server I had the opportunity to validate many of my theories on how Yahoo's AntiSpam technology works. Most webmasters and server admins are relatively clueless as to what makes email really run. Recently I was forced to migrate all my websites to new IPs. I knew I was going to take a hit for this but I didn't realize how much. This whole experience have given me a new perspective on how to get into yahoo's inbox with your bulk emails and newsletters. ATT and Verizon DNSBL Problems. Verizon and AT&T yesterday started bounced emails from my server. This was very unexpected, as non of my websites do any kind of spam. A few of them do send a newsletter but this is to a double Opt in Maillist. Everyone getting the newsletter signed up for it. So in this blog I will chronicle my journey to get this resolved with both ISPs. If this turns out good, then fine. If it turns out bad, then at least I will have documented it for the rest of the world.